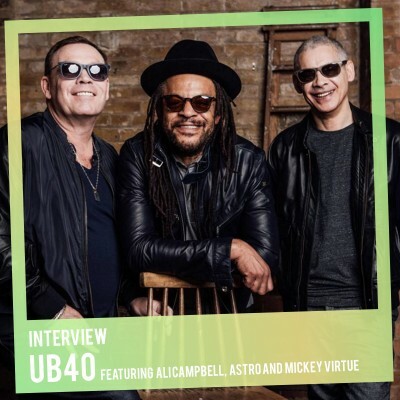 UB40 featuring Ali Campbell, Astro and Mickey Virtue reunites the creative powerhouse behind Britain’s most successful reggae band. Known for their huge hits Red Red Wine, Can’t Help Falling In Love plus their cover of I Got You Babe, their career has seen them release multi-Platinum albums and receive a Grammy nomination for Best Reggae Album four times. The Birmingham trio first began working together in 1978 and still continue to perform new material in front of sold out audiences. The vocals of Terence Wilson, better known as Astro, play an integral part of the band’s sound. We spoke to Astro in the run up to their upcoming Grandslam Tour on St. Patrick's Day about the changing nature of the music industry, the joy of performing live and what we can expect from them in the near future. UB40 featuring Ali Campbell, Astro and Mickey Virtue tickets are on sale now. Hello Astro. How has it been going today? What have you been doing? I’ve been doing interviews for the Grandslam Tour! (Laughs) I haven’t had chance to get one pint of Guinness down me neck yet. Are you doing anything for St. Patricks today? At Four-Thirty after my last interview I shall be getting slaughtered on Guinness. Good man! Let’s talk about your career. You have managed to sell an amazing 70 million albums worldwide and still hold a massive appeal. What has been the secret to this incredible international success? There’s no real secret. The real reason for out longevity is picking the right genre of music to play which is reggae. Because reggae is an international language which is recognised around the world and it truly does bring people together. People don’t necessarily have English as their first language but they understand a good drum and bass line and that speaks a thousand words more. That’s the reason why we’re still relevant; because of the music we play. And I suppose the lyrics as well, but they are very secondary. For people who don’t speak English it doesn’t mean anything to them but they understand the reggae beat. But lyrics are often very important. For instance, the first two UB40 albums were overtly political. Was there a compulsion to address the issues of the day in addition to pursuing a career in music? If you have a public platform then it make sense to talk about something worthwhile rather than some mundane lyrics about love. Y’know; boyfriend meets his girlfriend. It makes more sense to talk about things worthwhile like social issues because that way you can be passionate about something. You can’t trip yourself up. If you’re trying to fool people they’ll see through you rather quickly. But you say the first couple of albums, nothing’s changed. I think we’ve become victims of our own success with the Labour Of Love franchise because a lot of people think that’s what we are – a covers band. They don’t realise there is only three Labour Of Love albums that are covers. There is actually another twenty-one albums of self-penned UB40 albums and all of them are as political as Signing Off or Present Arms or UB40, or UB44, Geffery Morgan… loves white girls, Promises And Lies, Who You Fighting For? The success we had Can’t Help Falling and Red Red Wine, the general perception is that UB40 sold out and etc. which is not the case. If people bothered to look through the records and actually bothered to listen they’d realise we are as politically strong as we was, and we are now. Just because they hear Red Red Wine on the radio every single day all the time and Can’t Help Falling In Love every day, we’ve become victims of our own success. There are worse things to happen to a band than be successful! One of the songs I love UB40 for is Rat In Mi Kitchen. Didn’t you write that one? Yes, I did actually. At the time we were writing material for an album and I’d written that chorus. And Ali only lived about a minute down from me so I thought I’d pop down for some inspiration for another song. So, I banged on his door and said “I need a subject matter to write about”. He says; “If you give me a minute, there’s a rat that’s in me kitchen.” He kept losing him and that was it. So, I wrote about the rat in his kitchen and the rest is history as they say. Do you think it’s harder to make a living as band these days? Its hard enough to earn a living from playing music these days unless you’re playing live. Because of all the illegal downloads most bands are now seeing about a fifth of they’d normally have earnt and the only way bands can survive these days is to go out and play live. Which I don’t think is a bad thing. You can’t force anyone to play your songs. You can’t force anybody to listen to your songs. It’s all about mutual consent. Across the length of your career you have seen it all change. Back in the 70’s everyone was worried about ‘Home Taping Is Killing Music’, then later came the CD-R and now there is streaming. Does that mean you can only make money through live performance? It is the only way. Luckily for us, we’re one of the few bands that have toured constantly for our entire careers. There’s so many bands who were very successful in the 80’s and 90’s on records and they never toured. Now that their royalty streams are drying up, now they’ve actually got to go out and actually perform live and there’s so many of them that can’t actually do it. So, there is no money to be made in making your music easily available online? You need to concentrate on what you’re doing live and then you know what you’re earning. An artist like Lady Gaga on Spotify, one of the most played artists, and she’d amassed a massive sum of about three hundred quid. So, you can’t rely on that to keep you in silk stockings. The only way you can do it is to perform live and since I’ve got back with Ali and Mickey we haven’t stopped touring for three years. We did manage to have a couple of weeks off (well, a couple of days off) before Christmas last year and everyone was back out on the road again the day after Boxing Day. So, the only way bands are earning these days is by a live situation and I’m all for that. It sounds like you are quite the workhorse when it comes to touring and this upcoming Grandslam Tour is pretty long. Do you still enjoy it? Do you still get a kick out of being on stage? I live for it. I’ve got the attention span of an ant! In the studio, I get bored really quickly but live – that’s what I live for. I live for the reaction. I never get sick and tired. The only downside is the travelling. Hanging around in airports. That’s me biggest gripe but you can’t make an omelette without breaking a few eggs. There must be an element of instant gratification when you are on stage that you just don’t get in the studio. You play a song and then the audience cheers straight away. It’s a buzz you don’t get in the studio. Exactly. You could be working away in the studio for months. Working on what you consider to be the best thing since sliced bread but the only time you know whether or not you’re right is when the public have decided when they buy the record. You only find out if you’ve done something good after the fact. You teamed up with Ali and Micky just in time to record the album Silhouette. Was it like being back in the studio with them? That was fun, that was. Although most of that had been recorded before I joined back up with them. They put the release date back just so that I could jump on a few of the tracks and add my bit. It was great because I hadn’t been in the studio with Ali and Micky – it had been a few years. And it was great to see the banter was still there, the chemistry is still happening. And it was like we’d never been apart. It was so much fun doing it. No pressure, and that’s what it’s supposed to be. The second its stops being fun; change your career. The album that you then followed up with was an acoustic record which is quite a surprise as reggae is so bass heavy. Why did you decide to adopt that route? It almost like a contradiction in terms; an acoustic reggae album! We never set out to record an acoustic album originally. What happened was we were asked to record a few radio sessions for the BBC. Radio stations haven’t got studios big enough to hold an eleven-piece band and so we were asked to do stripped down versions. We did four or five sessions and each one was a couple of songs and so we had ten acoustic tracks and the record company said “Get a couple of more hits done” and they combined that with a greatest hits album and they put it out. A couple of weeks later we went Silver! So, it was a happy accident if you like. As you say, reggae is bass heavy so we renamed it as ‘Cuddly Reggae’ as it goes really well with Red Red Wine. What are you plans then when the tour winds up towards the end of summer? Is there a new record on the horizon? That would be nice but no such luck. No, we’re on the road until February of next year. We’ll be doing two tours of the states this year and we’ll be going back to Australia, New Zealand, Hawaii, South America – it’s an ongoing world tour. We’re gonna be in Dubai and Bahrain in a couple of days’ time. Its nonstop. So, it’s hard to find studio time, I think we may have a couple of weeks in April. That’ll be it for the year. But we have got a couple of projects on the go at the moment. Me and Ali produced a dub album a few years ago that you can pick up off the shelf. And there is a massive West Coast reggae movement in the States . There’s bands like Save Jah, Slightly Stoopid, Revolution and we’ve given our tracks to this West Coast posse and we’re also sending our soundtracks to Latin America and we’re going to let them do their thing on top of these tracks. We’re going to pick the best and pile them out and we’re going to try and tour that around the States. If that’s successful then we’re going to try and bring it to England and Europe. Plus, me and Ali while we’ve been out on the road, we never stop writing lyrics, there is a studio album in the pipeline. There’s this collaboration album, a couple of projects that I can’t really speak about now as its all under wraps but it will be all good for the public. Thank you so much for speaking to us today. After you have finally wound up the last interview, where will you be going for your pint of Guinness? At the bottom of my road is a pub so I’ll start there and then I’m going to make my way up to Digbeth. A little area in Birmingham which is ninety percent Irish and every single pub in Digbeth is an Irish pub. They have a St Paddys Day parade down there that lasts for about four hours. All the pubs have been open since seven o’clock this morning and they’ll stay open till seven o’clock tomorrow morning. So, I can guarantee you; I’m gonna be smashed.